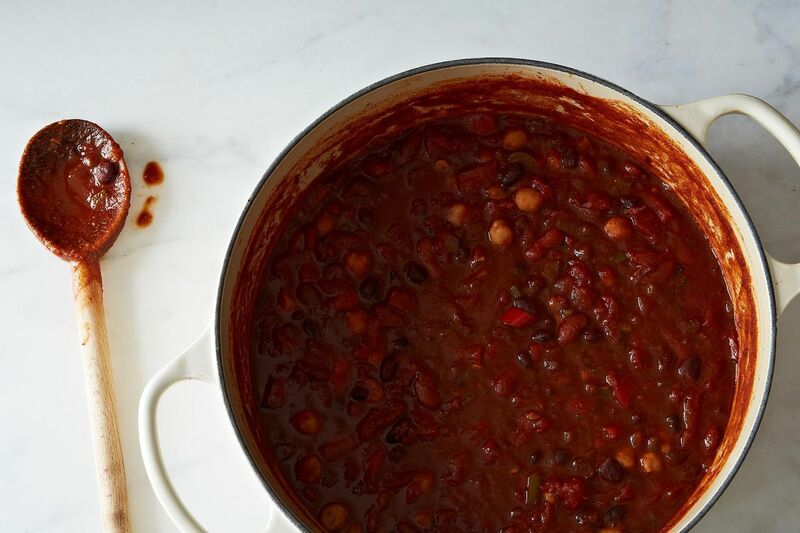 Today: As the days get shorter and the nights get cooler, we start craving chili. Now it's simple enough to make any night of the week, without a recipe. There’s something about chili -- so versatile and satisfying. Top it with cheese, sour cream, avocado, crumbled crackers, or diced fresh onions and hot peppers. Roll it into a tortilla with some rice. Pour it over a burger. It’s all good. My favorite recipe is a vegetarian version from my former restaurant in Fredericksburg, Virginia. Dedicated carnivores and vegans alike happily slurped it up. If you prefer meat in yours, by all means go ahead -- it’ll be terrific. I like to think of chili in terms of ratios. However you decide to proceed, and whatever ingredients you use, stick to about 2 parts diced vegetables : 2 parts cooked or canned beans : 2 parts tomatoes : a little less than 1 part (optional) added protein like tofu. This is a loose guideline, of course, but it gives you something to jump off from. 1. In a big heavy pot, heat up a pat of butter or a glug of oil of your choosing. 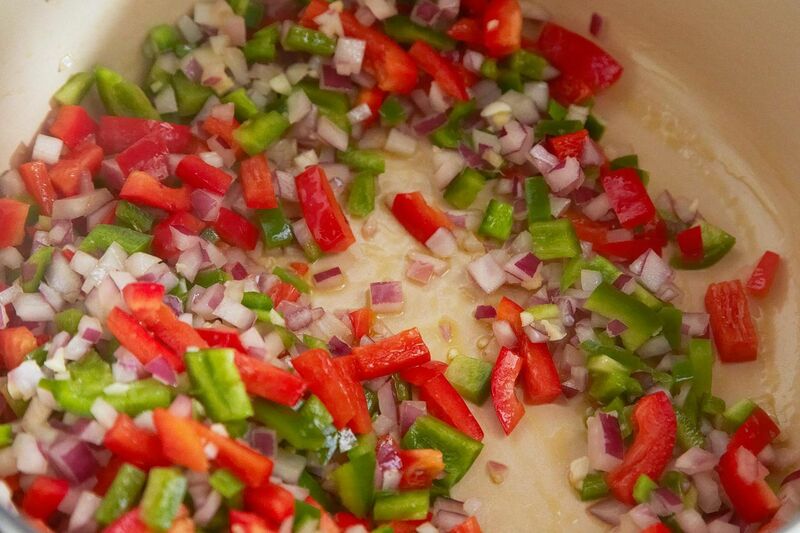 Sauté some diced onions, whatever combination of hot and bell peppers you like, and garlic. If you feel like some finely diced carrots, leeks, or celery, too, go for it. Add some salt and stir. 2. 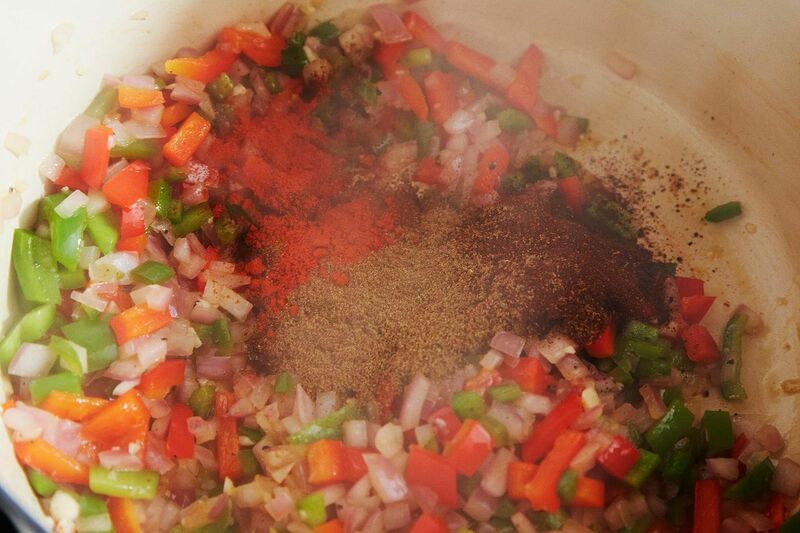 Add spices. I’ve used chili powder, cumin, turmeric, smoked paprika, chipotle, and various ground peppers; you should use whatever tastes like chili to you. Use 2 to 3 times as much assorted chili powders as cumin and turmeric. This is really to taste, but start with 1/2 teaspoon of cumin per cup of tomatoes if you need a benchmark. Salt and pepper to taste. If you didn't put in fresh garlic, add garlic powder here -- shoot for about the same amount of garlic powder as cumin. 3. Now, get your can opener ready! You’ll need beans and diced tomatoes. I love to use fire-roasted diced tomatoes and diced tomatoes with green chilis, but you can use your favorite. As for beans, I prefer a combination of kidneys, garbanzos and black beans. If you like to work with dried beans, I recommend cooking these first and then adding them now. You will probably also need to add 1 part water or stock at this point. Fill your empty tomato cans with stock or water as a measuring guideline and pour in liquid until it looks like chili. 4. Add more protein if you like. I’m a fan of tofu, so I cut a block of extra-firm into smallish cubes and toss it in. Tip: If you freeze tofu ahead of time, then thaw, then squeeze all the water out before you use it, you’ll be blown away by the texture. 5. Now just simmer for about an hour, mostly covered. Then add spice as needed and enjoy! Don’t forget to serve it over scrambled eggs for tomorrow’s breakfast. I've cooked and eaten in a bunch of beautiful countries, and I still haven't found anything that smells better than mushrooms sautéing in red wine and butter. I realize this thread is so old that probably no one will see this, but I’ve been experimenting with various vegetarian chilis all season, using quinoa, hominy, tofu, and all manner of chiles and spices. My best tip, though not strictly vegetarian, is to add anchovies (or even fish sauce) to the base, just after sautéing the onions, garlic, and peppers. It really adds umami and somehow enhances the body of the finished chili. It may be good but it will never be chili until you lose the beans and add meat to it. I have been making my version of veggie chili for 25 years. I call it South Point Chili, since it was inspired by my geographical location and lifestyle on the south point of Madawaska Lake in Maine. It's one of those dishes that you can add whatever. I like red kidney and black beans in mine plus mushrooms. I like to add frozen whole kernel corn as it adds a sweetness, and I toast the spices in the oil before stirring them into the onions and friends to deepen the umami. My recipe is available on my blog, A Cook's Journal Blog. Here's the link: https://acooksjournalblog.wordpress.com/2014/07/25/full-of-beans-plus-bonus-recipes/. Whoops! Did I say recipe? My bad! This looks delicious! You know, I wasn't planning to make chili tonight, but now your recipe is on the menu. Thanks! this is exactly what I was looking for, I wanted tips not an actual recipe, i never have all of what any one recipe calls for. I know how you feel. I used to own a restaurant, way back when, and I feel like I've never stopped looking at my fridge, taking a mental stock of what's there, and saying to myself, "What's today's special?" I'm totally a fan of the no-recipe recipe. I seldom use one unless it's the first time I've cooked something. I love your tip about freezing the tofu, and I'm going to try that soon. Am I the only one who likes to use pan "fried" peanuts to garnish things like vegetarian/vegan chili, curry and so on? Lots of protein there, and the flavor goes with almost anything. Love the crunch, too. Thanks! I've never tried it, but I sure will now! I love all these ideas I'm getting just by following a link to this now kind of old post. Do you just fry them until they're browned a bit? In what type of oil? I am all for throwing things together from what I have at home when time is short, but when I want something really good that brings rave reviews, I follow a recipe...Cook's Illustrated has a fabulous Vegetarian Chili--using dried chili peppers, bulgur and beans for texture, soy sauce, ground walnuts and dried shitake mushrooms for unami flavor---and that chili brings rave reviews. Thank you, I'm going to try that! If CI wrote it, it's sure to be a winner! Thanks for this! All I could find online was exact(ish) recipes, when I prefer to toss what I already have on hand in. Also, am I the only one who uses tomato paste? My mom taught me how to make chili using tomato paste. I'm wondering what other people's thoughts on it are? I used to buy a super-concentrated tomato paste when we lived in Europe, and it was perfect for soups. I do think tomato paste gives soup a richer flavor, though, since it's already cooked quite a while before it's canned. Since I like a salsa sort of feel to my chili, I prefer the fresh, bright taste of the diced tomatoes. But hey, if your mom did it, it must be terrific! I know that I am a wimp, but I would really love an actual recipe. 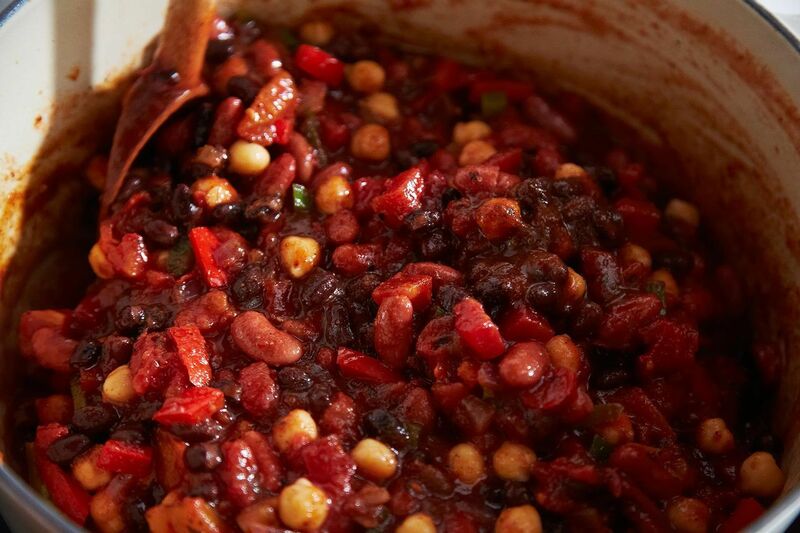 Never cook kidney beans from dried in a slow cooker! They contain a high level of natural toxins that will increase five-fold if cooked at a low temp. Always boil them for at least 10. min. to remove the toxins. Published bean recipes need to be more responsible and make this clear! Hi Beth, and thanks for the important info! I've never cooked kidney beans in a slow cooker. I'm glad to know how to do it safely, should I decide to give it a go! Cheers. Hi Beth, WOW! I never knew that. Great information. This is why I love to read the comments people leave with recipes. Thanks. I am passing this on. That sounds amazing—I love the ingredients you chose! And one of the best things about soups/chilis/stews is that they freeze beautifully. Hi Kathryn, I just posted above about how I love to read comments after a recipe is posted. This is the other reason. I love to see the different tips that are posted and ingredients that people like to use to change up the recipes. Love it. I also made a ton! I realized as soon as I started cooking that I needed to invite friends ASAP. Even with friends, my boyfriend and I also will have a ton of (delicious) leftovers. This is a great article! I made a fantastic vegan chili this weekend with homemade veggie stock and using some of the cooking liquid from the beans. Also rehydrated a few dried chilies with hot water and tequila and also threw that into the pot. It was fantastic! I also added one tbsp of tomato paste to thicken it up. I would recommend cooking for much longer than 1 hour....I kept mine going for almost 3 before I had a nice stew. Thanks! And you're so right, a longer simmer will only make it better. I think it improves with each re-heat, too. I love a recipe that isn't! This is about what I make. I use dried beans whenever I can (remember different beans cook at different times, so don't cook them all together--that was a pain! ), and like to use some of the bean broth in my chili. I agree with posters who add a little dark chocolate. I almost always add some tiny diced carrot for the change in texture, and love adding sweet potato or pumpkin if I have it. A handful or 2 of Trader Joe's frozen roasted corn is also a really nice addition at the end. I loved this article. It reminded me about the value of adding the spices to the veggies. I got really good results using Rancho Gordo beans. 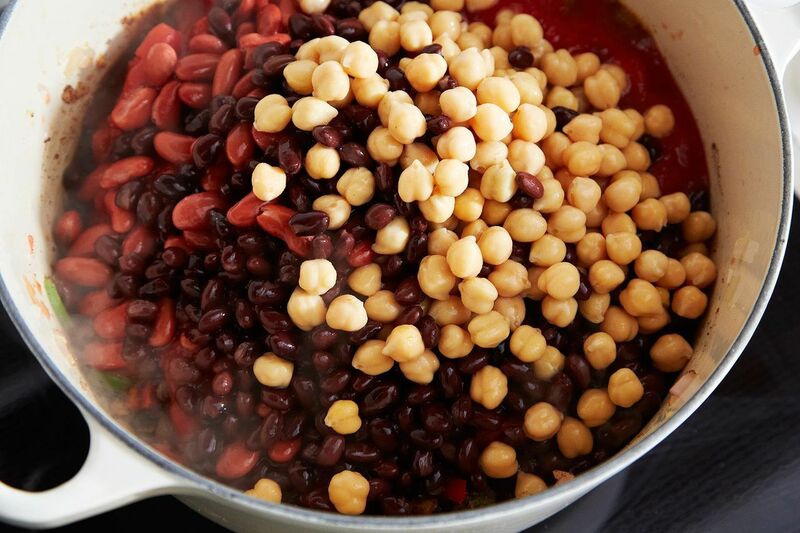 It's worth remembering how easy it is to cook beans-no presoak necessary. I started them stovetop and transferred them to 225 degree oven to cook while taking my grandson to the zoo. Came home and finished making chili with tofu. Made the cornbread with avocado too. A perfect post football/zoo meal. The Ceylon cinnamon/chipotle/paprika combination sounds lovely. Just thinking about how those spices smell together makes me want to get up and cook! I haven't cooked with TVP in years and years, but I remember it being really tasty. I'm sure it's great in chili. I've happily made this recipe with chicken, and I can even imagine that some good hot sausage would be a terrific, if a bit inauthentic, addition. I love using chipotle peppers in adobo and a square or 2 of Lindt 99% cocoa dark chocolate. There is something about the way the bitterness of the chocolate plays off the smoky heat of the chipotles that I can't get enough of, add in a lot of sweet ingredients like carrot, orange or red bell pepper and corn and you have veggie chili perfection in my books. I can see how pumpkin would be good, I might have to try that! Thanks to all these terrific comments, I have so many new, good ideas for chili! I used 99% Lindt for all my baking while we were living in Europe, and I used the 95% as my regular, everyday eating chocolate. I've found 90% and 99% at Target, of all places, but I haven't found the 95% anywhere. Do you know of a source? Hmm I actually didn't know they had a 95%, I have only ever seen 99, 90, 85 and so on down to 50%. I don't see 95% on their website (http://www.lindt.ca/swf/eng/products/bars/excellence/) either. Maybe they discontinued it. Keep in mind I can only see their Canadian site though. It auto-directs me there because I live in Nova Scotia. Maybe have a look at the US site (assuming that's where you are) and see what it has to say. Nothing sadder than a girl who can't find her favourite chocolate :( For snacking I like the 70% cocoa or the Ecuador bar which is all Ecuadorian chocolate and 75% cocoa. It has a subtle sweet floral quality that I have never tasted before, very unique and delicious. Best of luck on your chocolate quest! So excited to try this! I have so many vegetarian friends and chili will be great now that the weather has cooled down! Will post an update once it's been enjoyed! Thank you for sharing. I agree with the premise that as long as you start with some basics, use quality ingredients, sprinkle with a sense of adventure, and love, all recipes come out great! I have never thought of adding pumpkin, but tis the season, and I will try. This is terrific; and I tried the pumpkin addition. It was great. Use high-quality dried beans. It takes a little planning (just soaking overnight! ), but the end result is so much better. You can cook the beans first with whole spices – it will ultimately add a ton of flavor into the chili. Also, get creative with toppings. Instead of sour cream, try crème fraîche or even ricotta. Dried beans are lovely in this for sure! I recently made a batch of black beans in our slow cooker. I just threw the beans in with stock, tomato paste, a dried chipotle and some diced veg. It was crazy easy and the beans were the perfect texture.